Q: Why did I lose my fish? A: After a long, roller coaster winter, there’s nothing more disappointing than returning to your pond to find your fish floating and bloated in the water. This winter fish kill, or “winterkill,” can happen when the ice sheet on your pond prevents gas exchange and reduces the amount of dissolved oxygen in the water, ultimately causing your fish to suffocate. Shallow lakes, ponds and streams are particularly vulnerable to winterkill. What causes it, and how can it be prevented? Read on to learn more. Winterkill occurs when ice and snow cover your pond or lake for long periods of time. That solid sheet of cold stuff seals off the water, stopping oxygenation and gas exchange at the surface, but that’s not all it does. The ice and snow cover also prevent sunlight from reaching pond plants, which normally produce sub-surface oxygen via photosynthesis. Add to that a lake full of decomposing organic matter releasing toxic gases that are trapped under the ice, and your poor fish do not have enough oxygen to survive. The ones that do survive are not finned superheroes, but they are more tolerant of a low-oxygen environment than their dearly departed cousins. The species type and size makes a difference, too, in their ability to deal with less-than-optimal living conditions. Aeration: Aerate your pond year-round with an Aeration System to circulate the water, increase dissolved oxygen and keep oxygen levels more consistent throughout the pond. It will also keep a hole open in the ice, allowing for gas exchange. Muck Removal: Using natural bacteria, like MuckAway™, or a dredge in extreme cases, remove as much muck and decomposing debris as possible before the ice forms. This will prevent the pond from naturally filling in, and it will reduce the amount of gas produced from the decomposition process. Winterkill is a disappointment, but it can be prevented with some planning and preparation in the fall. In the meantime, restock your pond and enjoy! 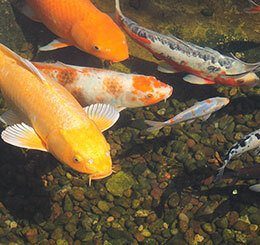 Pond Talk: Have you even experienced winterkill in your pond? What did you do to remedy the situation?